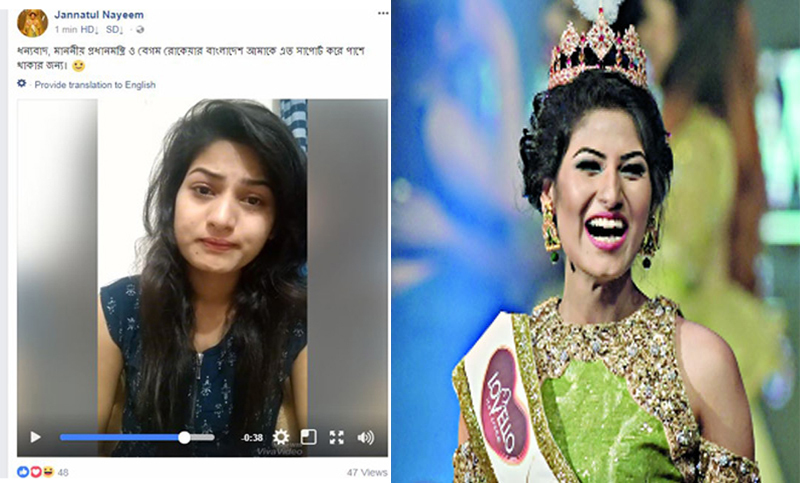 ‘Miss World Bangladesh 2017’ Jannatul Nayeem has admitted of her divorce on Tuesday in a video message on her Facebook wall. Earlier on Friday night, Jannatul Nayeem was adjudged as Miss World Bangladesh 2017. But, the news drew a widespread flak after it was revealed that Jannatul Nayeem was not the judges' choice. Rather, the judges selected runner-up Jessia Islam to represent Bangladesh at the Miss World contest to be held in November this year in Sanya, China. On Monday, Jannatul Nayeem again made headlines after news on her marriage surfaced in Media. According to a number of reports, the newly crowned Miss World Bangladesh got married to a businessman in Chittagong some four years ago. However, the couple separated some two and a half months after they tied the knot. The organizers have called a press conference over the issue at Hotel Pan Pacific Sonargaon on Tuesday evening.